If your FIFA 18 career mode squad is missing a young ST with high potential, look no further than Hamburg and Germany U-17 goal-getter Jann-Fiete Arp. Just as in real life, superb strikers are worth their offensive weight in gold in FIFA 18. While splurging the cash to bring big names into your team, nurturing a bargain signing until they become the next Robert Lewandowski or Pierre-Emerick Aubameyang adds a challenge to the game that makes it that much more rewarding. Arp is the perfect candidate for those seeking that additional rush of excitement. Hamburg’s wonderkid has an initial rating of 64 (M/M workrates, 3-star skill moves, 3-star weak foot) but boasts a potential as high as 85. If he achieved that, it would put him ahead of RB Leipzig speedster Timo Werner, who currently possesses an 82 rating. With a 21-point differential, 17-year-old Arp is the Bundesliga ST with the highest potential for growth in the game. He made his professional debut with Hamburg against none other than rivals Werder Bremen on Matchday 7, with his injury-time appearance in the Nordderby making him the first player born after the year 2000 to feature in the Bundesliga. After his formal presentation to the Volksparkstadion crowd, Arp went on international duty to the U-17 World Cup, where he reached the quarter-finals scoring five goals in as many games as captain for Germany. Upon his return, he immediately got the nod from coach Markus Gisdol and scored in his next two Bundesliga appearances, becoming Hamburg’s youngest scorer ever in the process. The arrival of a homegrown idol, who is a self-confessed Hamburg fan, has captured the imagination of many supporters. In his short career, Arp has already earned the nickname “Uns Fiete” (our Fiete), a direct comparison to none other than Hamburg’s all-time top scorer Uwe Seeler, affectionately known as “Uns Uwe” for his 137 Bundesliga goals with the club. Seeler himself has given his blessing for Arp’s new moniker and described the youngster as “an asset” for Hamburg. “I hope the club manages him properly. If he feels well, he should play”, said the Bundesliga legend. While standing just over six feet tall makes him a threat in the air, Arp’s strong suit is his ability with the ball on the ground. Players of his stature with such control are few and far between. Not only is he good at dribbling past the opposition, but he has a fine first touch and a deadly precise right-foot finish. His first goals against Hertha Berlin and Stuttgart, while a limited sample, are a clear testament to this. Perhaps most importantly, he displays the predatory instincts of all great strikers. His youth highlight reel shows a mix of amazing individual feats of skill and the nous always to be in the right place at the right time. Watch: Arp puts the Volksparkstadion on its feet by securing victory against Stuttgart. 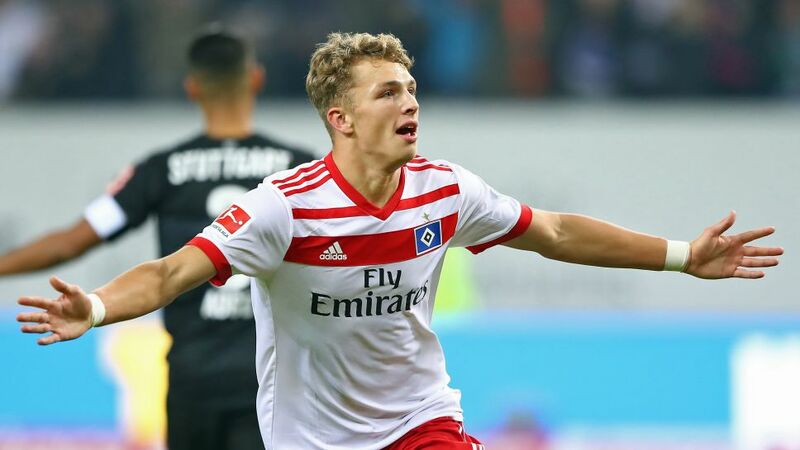 While Hamburg have made it clear that they don’t want to overhype their young star and put unnecessary pressure on him, Fiete (as the player has stated that he prefers to be called) is currently living a boyhood dream and loving every minute. “I was thinking of when, years ago, I was still standing in the north stand myself. That's what you always dream of, what you've been doing all the work for. And standing up and celebrating after such an important win in the north stand was beyond description,” the striker told bundesliga.com after scoring against Stuttgart. Will Arp’s rise signal a change in Hamburg’s fortunes? Only time will tell. In the meantime, you can get a glimpse into the future of Germany’s latest goal-scoring sensation by signing him on FIFA 18’s career mode. Watch: Arp’s Hamburg teammates take on the #FIFA18 Bundesliga Freekick Challenge.